Central Board of Secondary Education released CTET September Exam Notification for the year 2018 to fill the teacher vacancies in India. The aspirants who are interested in Central Government teacher jobs can check the CTET September Notification. Before applying candidates have to check the Eligibility conditions given by CBSE. Eligible candidates can apply Online for September 2018 CTET before the last date 19th July 2018. Therefore, candidates can fill the CTET September Online Application provided in the below sections. Latest News – CTET Apply Online Starting Date extended due to some administrative issues. So, keep watching for the Upcoming information about the CTET Application Submission dates. Central Board of Secondary Education conducts the CTET Examinations every year in the Month of February and September. CBSE has successfully completed the February term CTET Exam for the year 2018. Now, the Board has released the Notification for Central Teacher Eligibility Test September term. The candidates who are waiting for the Second Term CTET Exam can apply for CBSE CTET September 2018 Exam. The aspirants who are going to apply for September CTET can check the eligibility details provided in the below section. The contenders who satisfy the criteria can apply for CTET 2018 2nd Term Exam before the Last date. Good News for the people who have already attended and are not qualified in the CBSE CTET Feb Exam. Those candidates can also apply for Central Teacher Eligibility Test 2018 September term. The candidates who are having a passion for getting teacher job can utilize this opportunity. So, interested candidates can check Eligibility, Important Dates, Application and more details about CBSE CTET Sep. Eligible candidates can fill the CTET 2018 September Online Application form before the last date to avoid server issues. Application Date 22nd June 2018 – DELAYED!!! Deadline for Application 19th July 2018. Application Fees Last date 21st July 2018. Application Corrections dates 26-07-2018 to 31-07-2018. Exam Date 16th September 2018. The candidates should possess the minimum of Higher Education/Graduation with minimum of 50% or 45% Marks. Also, the candidates who have 2 years Diploma in Elementary Education are eligible. The candidates who are going to attend the CTET September Exam for Elementary School Teachers should have the following qualifications. Minimum 50% of marks in Graduation Degree from recognized University in India. Minimum of 45% marks in B.Ed. Full-time Diploma in Elementary Education from any of the recognized University. The candidates who are looking for Central Government teaching jobs can check the complete details of the Central Teacher Eligibility Test September Exam Notification. W have also given the Important Dates, Exam Fee and more details about September CTET Examination. Therefore, check the below sections to get the Central Board of Secondary Education CTET SEP details. Application Fee for CBSE CTET September will vary depending on the category. So, check the below-mentioned table to know the application fee for all category. 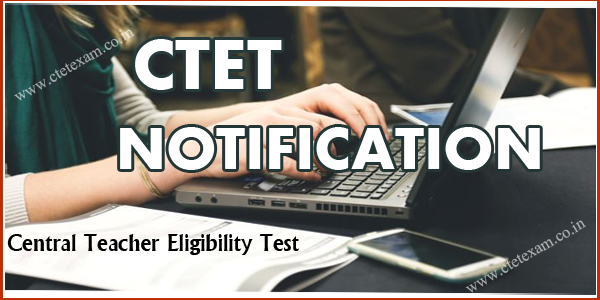 Check CTET September Exam Notification for more details. Central Teacher Eligibility Test 2018 Examination Fee has to be paid through Online or Bank Challan. The aspirants should pay the desired amount while filling the CBSE CTET Online application. Payments made by Credit/Debit card or Net Banking will be accepted. The CTET Application Fee paid through Bank Challan then, enter the Challan number while filling the CTET September Application Form. Notification Release Date: 12th June 2018. Online Application Starting Date: 22nd June 2018. Last Date for Application: 19th July 2018. Application Fee last date: 21st July 2018. Make corrections in Online Application: 26th July to 31st July 2018. Exam Dates: 16th September 2018. How to Apply for CTET September Exam 2018? Click on CBSE CTET 2018 Apply Online link. First, Enter the details required and register for CTET September Recruitment. Fill the CTET 2018 Online Application Form by logging in using Registration ID. Fill the details in the Application. Upload the Signature and Passport size Photograph. Pay the CTET Exam Fee. Take a printout of the CTET Application form for future use. Candidates can download the CTET September Exam Notification 2018, Information Bulletin for the detailed information. Before starting the exam preparation, you need to know the CTET Syllabus and also Exam Pattern. So, go through the following links and check the exam structure and syllabi. You can also download the CTET Exam Previous Years Question Papers for free of cost. When the notification and application forms will be out for September 2017 exam.we are eagerly awaiting for your answer. Dear Sir , Do guide us hoe to apply for job in Central school once we cleared the CTET excam. Do give us some contact Nos. or email , for further inquiry. I have my 2 years b.ed and b.sc and m.sc in economics. But I do not have a Diploma jn Elementary education. So it is possible for me to apply for the ctet exam? I have MA(Eng) and appearing in 2year d.el.ed so it is possible for me to apply for CTET exam. Hlo sir i m pursuing b ed course . Now I’ll be in 2yr (3rd;sem) from july . sir i am Bsc graduate. i have did bed in Hindi,i wants to apply for ctet. sir which book i will read?because there is tow book is available in paper-ii(math and science) and (social studies and social science). sir kindly give some idea…. Sir, how can I apply for medium of exam Malayalam (code- 09)?